1:51 dip passing the Moon T90 timeline was quickly reversed; did it pick up enough Moon Juice for a good rally? 1:24 there are no guarantees that a fractal pattern fill complete; fractal comes from the word fracture. 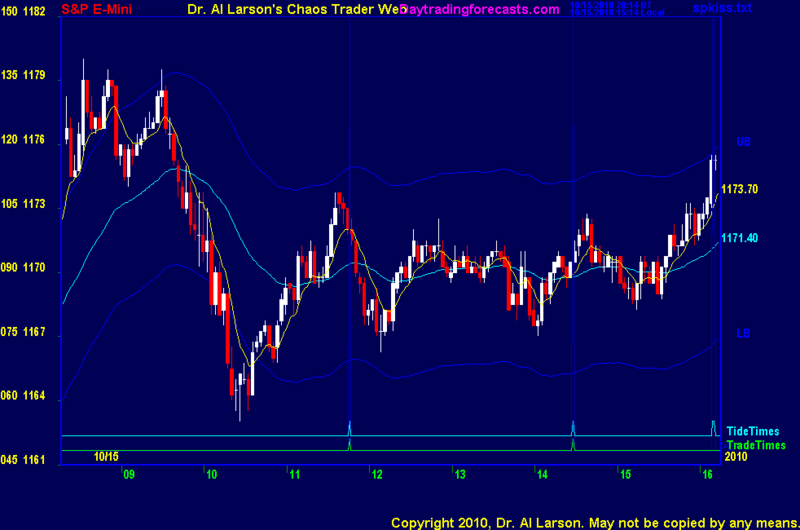 But if the Fractal of Pi I'm watching completes, we should see a rally starting near the next trade tine. 1:12 the EXMA's are flat=dullness. Many traders leave. They miss the Chaos that follows Dullness. 12:53 I use my overlays primarily on my two day charts, like the MTRainbow chart. so they give a lot more information about the overall behavior of a market. 12:33 Using my eMylar overlays has been very successful for me. Markets are chaotic systems. Chaotic systems for fractals. 10:43 Our hotline trading approach does not do counter trend band edge trading; but this looks like a band edge. 10:03 1171 is also the Pluto +P180 electrid field flux price. 9:58 1171 is a prime number-got nice bounce after the Consumer sentiment report. 10/15/2010 2:18:20 PM MT TG****:: I bought 68.75 right at the 2:09 tide time and exited at even. Rebought 70.0 and managed to hold for 5 into the close. 10/15/2010 1:47:57 PM MT TG****:: Have a great weekend Al, MM, and everyone else. 10/15/2010 1:47:28 PM MT TG****:: really nasty afternoon. started to form a converging triangle, then seemingly broke out of it to the upside just after the tide time only to go back into the triange. Now that nearly everyone has given up on the upside and then the downside, it wants to make good on that intial strength coming out ot the last tide time.